DISCOUNT: Enjoy this top vacation rental home at fraction of the normal cost. Book now and take full advantage of 2019 April and May's incredible rates that have already been discounted! Thank you for looking at our home. Sarah and I strive to provide each guest nothing but the best service, best accommodations, and best vacation. Don't hesitate to contact us with questions about the home or anything else we might be able to help with. 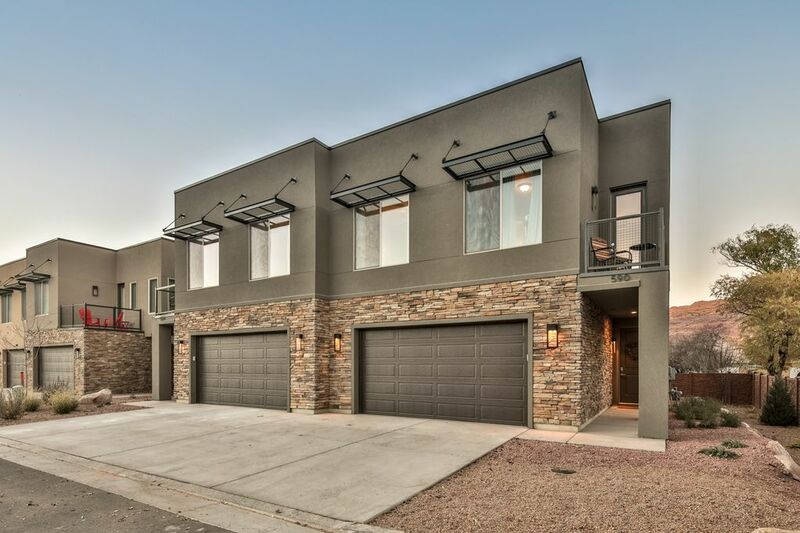 We are the ONLY duplex in Entrada located at the end of the street. When you rent our townhome(s) you have the most privacy and parking available in Entrada. Depending on the dates, length of stay, or other factors your vacation may qualify for an unadvertised DISCOUNT. So before you book somewhere else, make sure to contact us!!! NOTE: You may combine this unit and unit 594 and have an 8 bed 6 bath rental. Please email for full details! 1) Brand New Construction (2018) – New cabinets, flooring, paint, light and plumbing fixtures, Samsung appliances. The home also has new linens and towels from stores like Restoration Hardware, West Elm, Pottery Barn, etc. 2) Gourmet Kitchen – Enjoy cooking in a chef-inspired kitchen with brand new, top of the line appliances, laid out in a user friendly environment. We also fully stock the kitchen, providing more than the cooking basics, that are very well organized. Just read our reviews on our other homes! Plus there is a ton of seating, making this the kitchen the main hub for your entertaining. 3) Bikes – Our home comes with 5 free townie bikes for cruising around town. As well, our garage is equipped with a mountain bike a work station that is fully with any tools you'd need to keep your bike ready for the next trail! 4) Size and Location Matters – Brand NEW construction (2018) our comfortable home is ideal for your vacation. The home sits tucked away on a back corner, ensuring loads of privacy. It’s also minutes away from downtown Moab. 5) Children Friendly – While beautifully decorated, our home is very children friendly. With even a little play area with a TV under the stairs. 6) Television – Relax and enjoy the best streaming has to offer. The main TV’s have NETFLIX, HULU, AMAZON PRIME, HBO, SHOWTIME, STARZ, CINEMAX, ESPN, CNN, and dozens more channels, etc. to optimize your TV viewing experience. 7) Parking – You have access to our 2 car garage. 8) Dog Allowed – Our private property allows, with strict restrictions and a $300 fee, your best friend to join the fun. 9) Wi-Fi/Internet – Our home is equipped with super-fast, wired DSL service with an upgraded router that is centrally located to ensure strong coverage wherever you are throughout the home. 10) Community Pool and Spa – Brand new (2018). 11) Customer Service – Sarah and I firmly believe that superior customer service sets our home apart. We work to accommodate nearly any request a guest may have. Like early or late check in and out’s (if available), extra guests, special item requests, 24-hour on call cleaners/handyman, to name a few. And the best part is, we NEVER charge these extras. 12) Air Conditioning – Newer AC Unit, Blows ICE COLD!!! Even when it's 125 degrees out! 13) Guest Reviews – Still not sure, please read our 200+ reviews!!! We love sharing our home(s) with you! Look at our other properties, 70+ 5-STAR Reviews! Can be combine with our second unit for an 8 bed 6 bath rental! We loved this place. It is in the center of Moab, clean, spectacular, lots of room, very comfortable beds and furniture. The kitchen is stocked with all the needed plates, utensils, etc (just bring your food and you are all set). We can't wait to go back! We love this place! It's new and clean, and very spacious for 7 of us including 3 kids and two dogs. There is a secret closet for kiddos, which is very cute. It equipped with Apple TV in all the rooms. We had some good movie nights here. We enjoyed our stay very much! Would definitely recommend this place! Exceptional property - LOVED IT! We truly enjoyed our stay! The property exceeded our expectations in every way. Close to the downtown core, the location was very quiet, private feeling. The downstairs living space layout is social and had pleanty of room for all of us to gather, the kitchen well stocked with everything you could want should you choose to cook at "home" as we did. Beds were super comfortable, bedrooms and bathrooms spacious...pool, hot tub, the garage, bike tools and townie bikes really was an added bonus! We will be booking again for next year and can hardly wait. We were very impressed with how well furnished and decorated the place is, and perfectly stocked with everything you could need in every single room: bikes and tools in garage, kid dishes crib high chair, big soap/shampoo bottles in showers, and kitchen is stocked with everything you could possibly need. The home is new and has a spacious and well planned layout. The owners/property managers were great to work with and went above and beyond to make sure we enjoyed our stay. Top notch rental! The apartment is really nice and clean. We had a great time. The place was perfect. It was very nice and clean. We will definitely recommend it to friends and family.